Being a nonprofit organization that is dedicated to the mission of consumer protection, AGS Laboratories takes the security of their diamond grading reports very seriously. 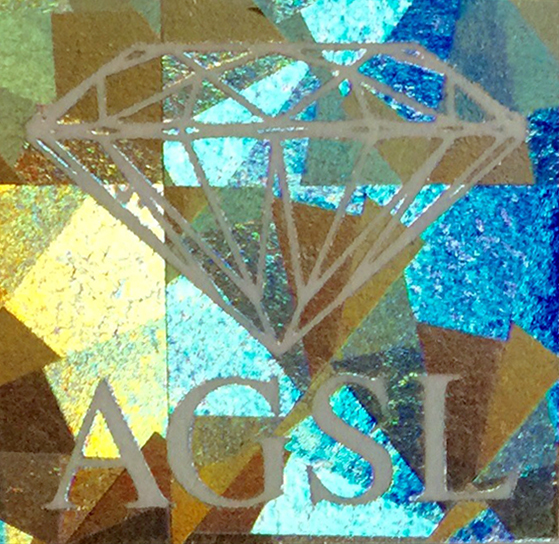 If you have an AGS Laboratories diamond grading report, take a close look at it. Have you ever noticed any of the security features? Some are apparent and some are hidden. We feel you should know about the six security steps AGS Laboratories has taken to ensure the authenticity and security of your diamond grading report. Just like U.S. currency, the paper used to create your diamond grading report is tracked and signed in and out. When documents need to be printed, the paper is taken from its secure location, counted, and then signed out. Once printed, it’s counted again. The amount of paper that was originally signed out must match the amount that was printed. If a document is misprinted, it will be securely discarded. This action must be added to the report, that way the destroyed document isn’t recorded as missing. Each document contains a special hologram unique to AGS Laboratories. Like the paper, these holograms are counted, signed in and signed out. It also contains its own security feature: if you try to peel it off, it becomes illegible and cannot be reapplied. Each document has its own unique barcode, which is just one more way the security of your document is reinforced. At the top of each document appears a Quick Response (QR) code, which can be scanned with any QR app found on a smartphone or tablet. The QR code ties in with the AGS number and barcode found on each document. If the algorithm within the QR code verifies that both numbers match in our database, it will connect to the report verification page on the AGS.org and agslab.com websites. AGS Laboratories is the first to have both a barcode and a QR code on laboratory documents. On the reverse side of the document, you will see something that looks like a hologram but is, in fact, a proprietary security mark woven into the paper. Examples of unifraction embossing can be found on some foreign currency. The lamination on your document keeps it looking like new. It protects against damage from liquids, the transfer of oils from our skin, paper-loving vermin, and the general wear and tear of time. It’s also bonded to the document; if one attempts to peel it off, it will destroy the document, removing ink in the process. So, there you have it: the six security features on your AGS Laboratories diamond grading report. These six features can only be found on full and half page documents. Go ahead and count them. Scan the QR code. Be confident you have an authentic and secure document in your hands. We know shopping for a diamond or diamond jewelry is a big investment, and at times can be intimidating. 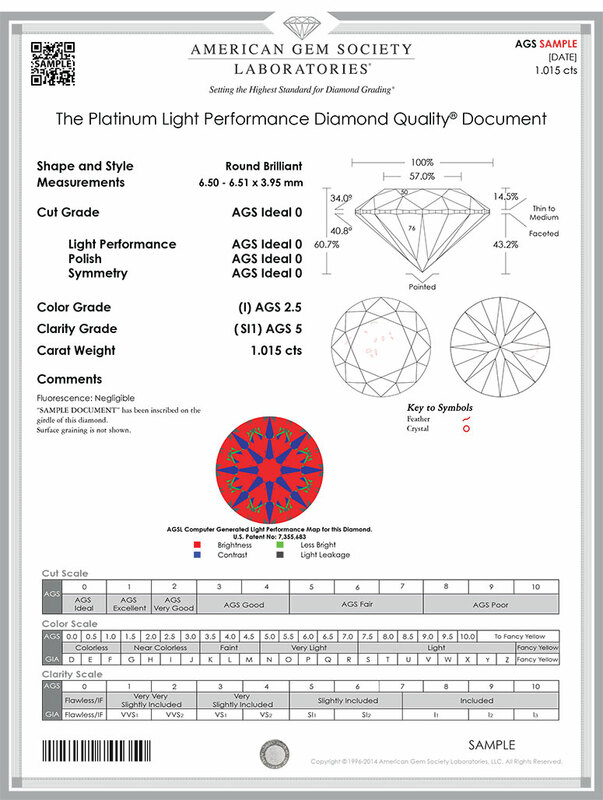 Always ask for an AGS Laboratories Diamond Grading Report to help you make an informed purchase. And, be sure to shop with an American Gem Society credentialed jeweler. They will explain your desired diamond’s AGS Laboratories Diamond Grading Report, as well as tell you about the qualities and characteristics that make your diamond unique. To begin your search for an AGS credentialed jeweler, visit Find a Jeweler. Get social with AGS Laboratories on Facebook (www.facebook.com/agslabs) and Twitter (@AGSLabs). Jewelry trends change over time, influenced by the factors that make up life. Designs wax and wane in popularity, often cycling through many times as resurgences. There is a strong emphasis in modern jewelry designs of this period reminiscent of the Art Deco movement. Angles, striking and sharp. Colors, bold and dramatic. Shapes, odd and thought-provoking. It was the Roaring Twenties. A time of economic prosperity and technological advancement, a time of jazz and a celebration of life. The shadow of war has passed, and the world is recovering, and growing. The place is Paris, the most romantic city in the world. This is the era that Art Deco was born from. Pink sapphire diamond pave mosaic ring by Armadani, featuring French cut pink sapphires and round brilliant diamonds. In 1925, the International Exposition of Modern Industrial and Decorative Arts took place in Paris, France, and marked the start of the Art Deco movement. The movement would continue up until the start of the Second World War, but would have a resurgence in popularity in the 1960s and again in the 1980s, thanks to a book published on the subject in 1968, and then to the rise of graphic design in the late 80s. Where most design movements rose out of political or religious intentions or stresses, Art Deco was simply artistic. The movement inspired clothing, architecture, art and of course, jewelry. Unlike its predecessor, Art Nouveau, with its more whimsical, light designs, Art Deco was all about lines, interesting shapes and a modern flair. These timeless pearl and diamond Fan Earrings by Mastoloni, are part of the Deco Collection. The inspiration for Art Deco came from advancing technologies and living life to the fullest. The world was speeding up, and this contributed to the modern feel of the movement. During this period, many famous archaeological finds took place, including excavation of King Tut’s tomb. Ancient influences, especially from Aztec and Egyptian cultures, can be seen in many Art Deco pieces, and the contrast between the geometrical shapes and ancient motifs creates a fanciful and unusual style. Platinum was “discovered” during this period as well, and was used in many Art Deco pieces along with the finest of gems including blue sapphires, bright emeralds, and stunning rubies. Diamonds were also widely seen, set as both facial points and accents. Many opaque stones were popular as well; Carnelian, lapis, turquoise and black onyx. Gemstones were cut into interesting shapes such as trapezoids and octagons, elongated rectangles and squares, sometimes with rounded corners. The cutting of these stones was often done wasting quite a bit of rough, but that just showed the lavish nature of the era. Glass and new plastics were also very popular substances to use in jewelry and art, as well as non-precious metals like titanium and aluminum. The jewelry was large and was made to draw attention. Straight lines, cubes, and chevrons, along with structured curves, all mixed together to create a jumbled, yet beautiful, style. Necklaces, pendants, bracelets, rings, brooches, and earrings were all made in the style of Art Deco, with an emphasis on being bold. Art Deco is an expression of functionality, elegance and a passion for life. Unique Settings of New York presents their custom Art Deco-inspired designs. 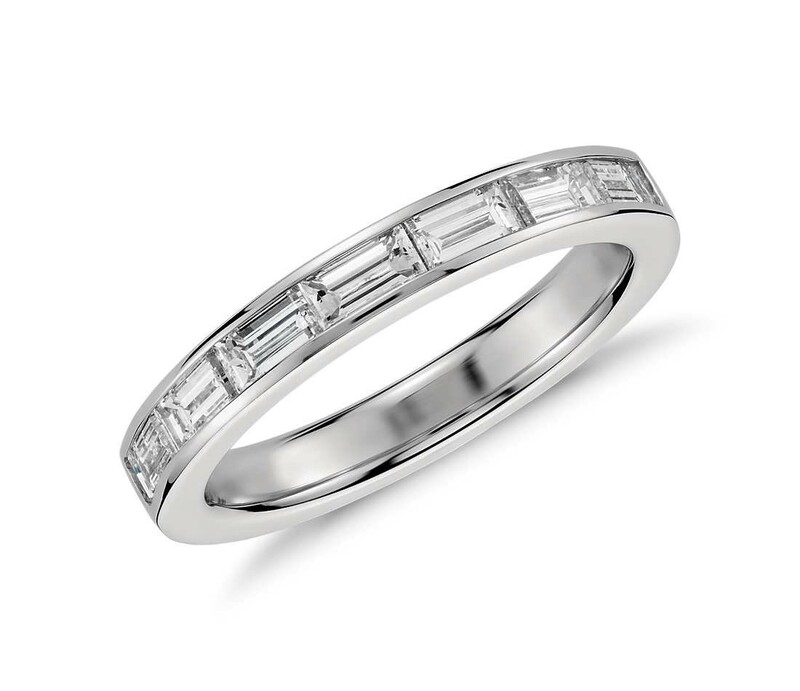 The ring above is 14K white gold with a 1.00 CT center stone, and 0.30 tcw in side diamonds. Just like in the past, the current atmosphere in the USA is one of hopeful growth; the economy is recovering slowly from a recent recession. The tinges of the last war are fading from memory. The world is advancing at a fast pace, with emerging technologies and ideas. The similarities of past and present are surprising, lending a hand to the new geometric shapes emerging from top designers. A revival of Art Deco is in the air, with the classic looks from the past mingling with a new take on the movement. There’s never been a better time to add a striking and unique piece of wearable art to your collection! 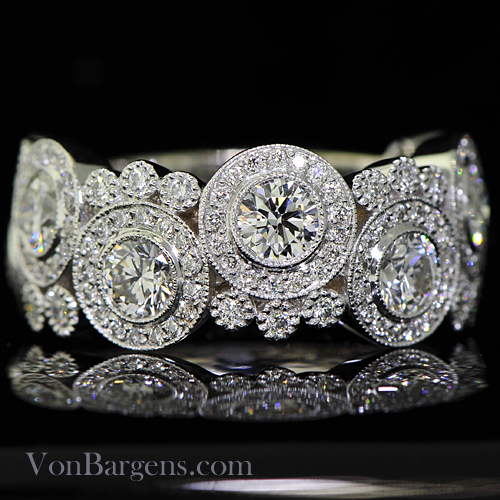 The drama of the Art Deco period comes to life in this beautiful bracelet by Joshua J. Fine Jewelry. It features an Old European cut center diamond, with a splash of green emeralds for accent. A critical step in protecting and preserving the value of your jewelry is getting an updated appraisal on a regular basis. In fact, if the most recent appraisal of your jewelry took place five or more years ago, it’s time to get a new appraisal. You may be asking what a jewelry appraisal does for you. 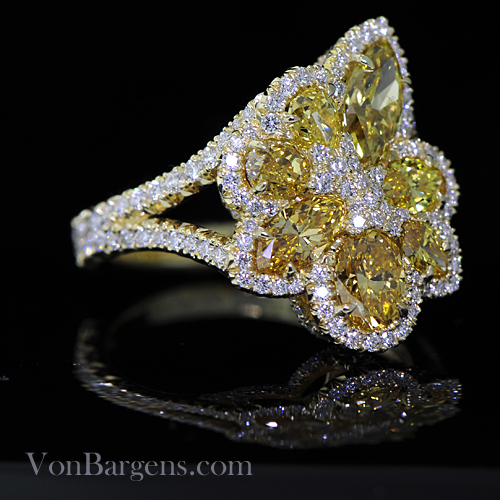 The obvious answer is that an appraisal sets a value for your jewelry. And with today’s roller-coaster values for gold, platinum, silver and gemstones, knowing what your jewelry is worth can save you heartache later if your jewelry is lost or stolen. The appraisal provides basic information most insurance carriers need to offer coverage for your jewelry. The updated value, along with the detailed description provided by an appraisal, will help smooth your settlement process if you were to suffer a loss. Another appraisal benefit is having an updated assessment of your jewelry’s condition. Over time, prongs, clasps, settings and even stones can become loose or damaged. The review of your jewelry by a professional can help mitigate a possible loss by drawing to your attention any minor damage so an item can be repaired. Now that I’ve convinced you to get an appraisal, who should you go to and what should it contain? The first choice for your appraisal should be a jeweler you trust. They should have the credentials necessary to do an appraisal, such as a Certified Gemologist Appraiser (CGA) from the American Gem Society, and/or be a member of one of the appraisal societies that dictate ethical appraisal practices. You may already have a grading report from AGS or another lab. These reports are used to verify the quality and authenticity of gemstones or diamonds, but do not establish value. What is the jewelry item made of? What type of gemstones are used? How are the stones graded? How is it designed or fashioned? Phillip Bosen is the Director of Business Development at Von Bargen’s Jewelry and the only Certified Gemologist Appraiser in Vermont. To find a CGA or ICGA in your area, click here. Laura Stanley is like many American Gem Society jewelers: her family has a rich history in the industry. In her case, she is a third generation jeweler. It started with her grandfather, Charles B. Stanley, a watchmaker in downtown North Little Rock, Arkansas. In 1936, he and his wife, Sally, opened a small jewelry store that throughout the years grew, and was passed down to their son, Loyd. Today, his daughter, Laura is a vital force in Stanley Jewelers Gemologist, a family business specializing in fine jewelry and fine service. With such a rich history, it is no wonder that they know a thing or two about heirloom jewelry—and how to give these cherished pieces a beautiful, updated look. Customizing heirloom jewelry is a growing trend. We asked, Laura, a CGA with the American Gem Society, some questions to learn more about updating these precious family treasures. Living in an area rich in history, do you see a lot of heirloom jewelry coming in? I feel like there is interesting and worthy jewelry all around the country. People are very mobile these days. Jewelry and heirlooms move around! I have learned to never underestimate what is tucked away in safety deposit boxes in small town America. I’ve seen everything from worn out 150-year old pot metal jewelry to large, impressive diamonds (over 10 carats). Are there any rules of etiquette a person should consider before they update a piece of heirloom jewelry? For example, if the person who gave them the jewelry is still alive, should they let them know their plan? Many people are uncomfortable resetting diamonds or gemstones received from a relative who is still alive, even with their permission. However, there are no rules and you should do what is in your comfort zone and makes you happy. And know that once you take apart your vintage piece, there is no going back. What is one of the most interesting piece you’ve revamped? A ring we nick-named “Jaws.” It was a 3-row antique platinum ring, about 1” wide, with two rows of marquise cut diamonds and one row of baguette cut diamonds. We made a wedding band from the baguettes and a bracelet from the marquise cut diamonds. Here’s a picture of the “after” pieces. What is your top piece of advice for someone who has a piece of heirloom jewelry that they want updated? Be sure you want to take apart your heirloom, then find an experienced jeweler to help you understand your options and the possibilities of what you have. Also keep your mind open to adding a few diamonds or gemstones to achieve the look you ultimately want. Conversely, be aware that you might not to be able to use every single diamond in grandmother’s brooch or ring. You may have some leftovers. Does it cost more to update a piece of heirloom jewelry than it would be to buy a new piece of jewelry? That totally depends upon what you have and what you want. 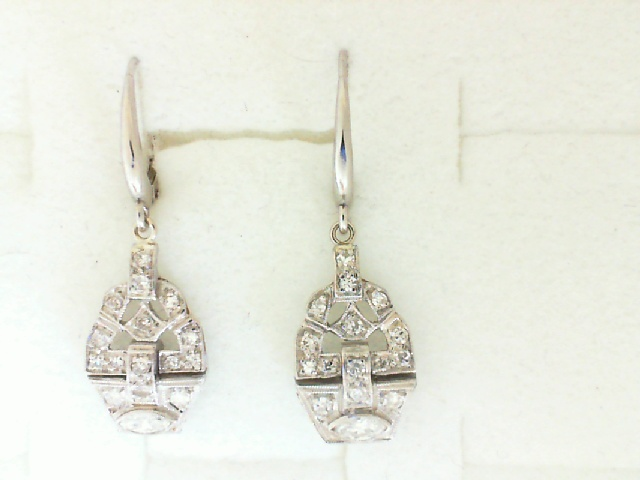 Here’s an example of earrings we made from a beautiful platinum antique diamond watch. A young woman inherited the watch and knew she would never wear it. So for a modest labor fee, we cut these clusters out of the case and she used the leftover platinum and diamonds to help defray costs for the project. 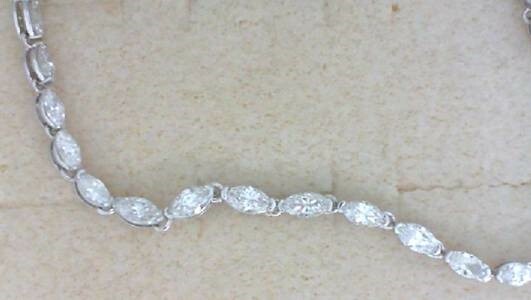 What is more fun for you as the jeweler: creating a new piece of custom jewelry or updating an heirloom piece? I think they are both thrilling because working with a customer to get exactly what she wants is always fun. It’s one of the best parts of being a professional jeweler! What are the challenges of working with heirloom jewelry? Occasionally you have to work around diamonds and gems that have been damaged over the years. Sometimes you can’t tell the extent of the damage until after you take it apart. That’s no fun for anyone, but sometimes it is unavoidable. Do you find that there is a tug-of-war of emotions for the customer between wanting to keep the heirloom piece in-tact, versus the desire for a new look? Other times it’s a long process to determine what the right decision is, and if we should even touch it. Sometimes the right answer is to do nothing, expecting that their next generation will want a piece intact. What other advice do you have for someone looking to update their heirloom jewelry? Find an AGS jeweler to help. That way, you’ll be in good hands regardless of your needs. To learn more about Stanley Jewelers Gemologist, visit http://stanleyjewelers.com/. To find an AGS credentialed jeweler in your area who can help you customize and heirloom treasure, visit http://www.americangemsociety.org/find-a-jeweler.